Most startup founders have big dreams: six-figure deals, world-class brands as clients, and steep, steady growth. But before your startup can make it big, you need a plan for how you’re going to get there – including targeted marketing and sales strategies that allow you to reach your ideal customers. Of course, that means you need to know who your ideal customers are! Basically, we want to make it as easy as possible to nail down who your ideal customers are, so you can find them, make more sales, and grow your business. We even created a downloadable ICP framework to simplify the process – which means there are no excuses to skip this crucial step. 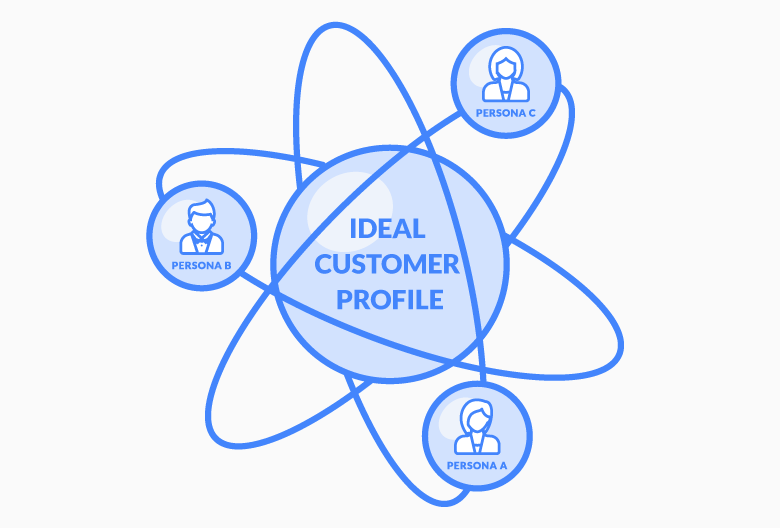 An ideal customer profile is a categorical description of a customer that would benefit immensely from your offering and provide you with significant value in exchange. 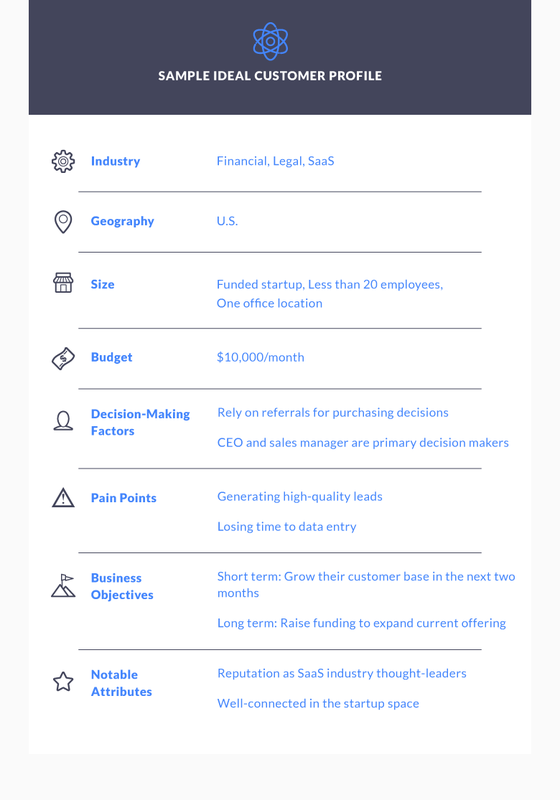 For a B2B startup, an ICP is a hypothetical business or organization that would get the most out of the software or product sold by the startup. Your ideal customer is the specific to your goal and your offering, and your ICP represents the type of customer you want to focus on acquiring over a set time frame. With B2B, the most important factor is ultimately that you help the business improve their bottom line. You might also offer value in other ways, like reducing their expenses, improving employee morale, alleviating pain points, and saving them time. An ideal customer can provide value to your company in several ways, the most obvious being that they pay you in exchange for your offering. But there are additional factors that can play into your ICP, like referrals to new clients, testimonials, constructive feedback, customer insights, and advocates for your brand. An ideal customer profile is not the same thing as a customer persona or user persona. You may want to develop several user persons as well – but not until after you’ve defined an ideal customer profile. User personas are the Sales Sally’s and Entrepreneur Eric’s that you might come up with down the road to define buyer or user characteristics. These personas represent the end-users of your product and are intended to help you get inside their head (sometimes called “empathy mapping”) when coming up with messaging, campaigns, and even new features. Customer personas are extremely useful, but you can’t develop effective personas without a broader understanding what types of companies they work for – a.k.a. who your ideal customers are. So, focus on the types of companies you’re targeting first and then drill down into more specific personas later. Determining your ideal customer allows you to figure out who you should be targeting with your marketing and sales efforts. The more detailed your profile is, the more accurately you can zero in the companies that are most in need of your service and most likely to give you their business. More specifically, there are four major benefits to creating an ICP. The more specific your customer profile is, the more targeted your sales and marketing initiatives can be – which means you’ll be able to better identify and attract high-quality leads who are ready to buy. By dedicating your team and resources to high-quality leads, you’ll waste less time and money pursuing the wrong leads. A detailed ICP also helps you better understand how to reach and sell to your customers, which means more accurate forecasting, more closed-won deals, and more predictable sales. Creating an ICP allows SaaS companies to streamline customer onboarding and reduce customer churn. The better you know your ideal customer, the better you can cater your offering and services to meet their needs. Since ideal customers derive real value from your product or service, they’re generally happy to recommend you to other potential customers. They’re grateful for the fact that your product makes their day-to-day operations easier and likely work with similar companies in their industry, which makes them likely to refer your offering to other business owners. An ideal customer is ready, willing and able to purchase your solution. Beyond that, they’re also likely to experience extreme success with your product, maximize your profitability, provide you with referrals, and even become brand advocates. Let’s get down to business. Follow this step-by-step guide to create your own ICP. The best way to develop an accurate ICP is to compare and analyze existing customers who are getting immense value from your solution. First, identify those who are not just using your product, but who love the product and are getting more value from it than your average user. Try to come up with a list of ten super users, but as long as you have a few this will work. Looking at this list, what do you already know about your top customers? If you’re missing data on their budget or company size, work these questions into the round of interviews you’ll conduct in the next step. Next, set up a phone call with your top users to chat about their experience with your product. The goal here is to learn more about their buying process: how they discovered your solution, why they decided to purchase, and how they’re benefiting from it now that it’s in practice. How much research do they do before committing to a purchase? Do they rely on referrals to find solutions? How did they hear about your company? Do they require approval by a committee? Why did they decide to purchase your solution in the first place? Why do they continue to use your solution? You should also try to learn about their specific pain points and how your solution solves them. What are their major pain points? What is the primary problem they need solved? What solution does your product provide? Once you’ve conducted the interviews, collected the data, and plugged it into your CRM tool, look for common threads among your most successful customers. Try to identify any recurring patterns or characteristics shared by your best customers and use this to inform your ICP. If you’re ready to create your own ICP, download this ICP framework to get started. It includes step-by-step instructions along with an ICP template. If you’re looking for more sources of inspiration to help you build and develop your ideal customer profile, here are a few suggestions. Look at customer feedback and read online reviews to learn more about customer pain points. Customer complaints can be quite constructive if you use them to understand what your customers are hoping to achieve with your product. Google Analytics can reveal plenty of details about visitors to your website. By analyzing your audience’s behavior on your website, you can learn more about what they’re most interested in, which blog posts they spend the most time reading, and other factors that help you profile them more accurately. If you’ve got a small cohort of extremely profitable customers, run a report to learn more about their demographics and sales process. Look at which products and packages are most popular among this group. Compare closed-won accounts to see what happened right before a customer made the choice to buy from you. How did they discover your solution in the first place? Was there an event or interaction that helped them make their decision? 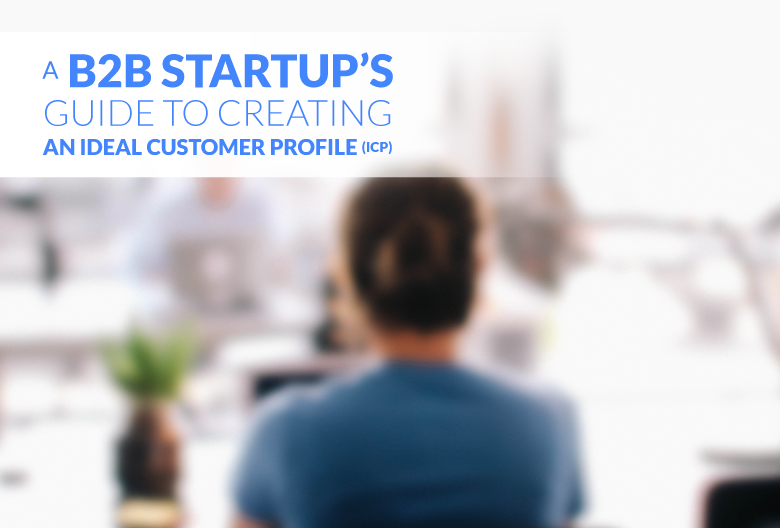 Here’s a list of questions to mull over when creating your ideal customer profile. Answering these will help refine your ICP so you can come up with targeted strategies to engage with your ideal customers. What are their brand values? What are their immediate business goals? What obstacles might they face in reaching these goals? What are their three biggest pain points? How do these problems impact operations? What would be the ideal solution to these problems? Does your product or service address or solve this problem? What would be the biggest barrier to them purchasing your product? In what ways will your product provide value to the business? Does your service feel like it’s targeted to this type of business? Does your website and content clearly speak to your ideal customers? Once you’ve defined your ideal customer, you can use it to generate high-quality leads with characteristics that match your ICP. You can also develop user personas to help your team further optimize your marketing and sales strategies. We also recommend comparing the ICP to the rest of your customer base, current prospects, and churned customers to see if any relevant patterns emerge. Ready to create your own ICP? Download the framework to get started!